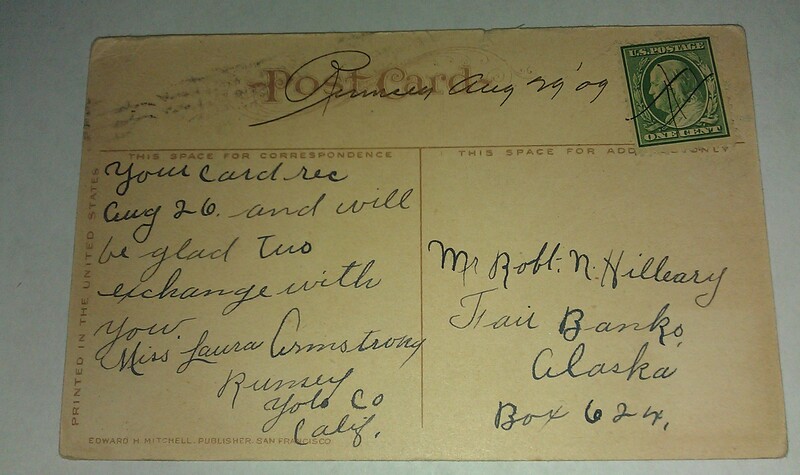 1909 Rumsey Yolo CA DPO Manuscript Town Cancel Un-Recorded Williams to Alaska Post Card Aug. 29 1909 manuscript dated town cancel Yolo county California. Unrecorded Williams cancel type. 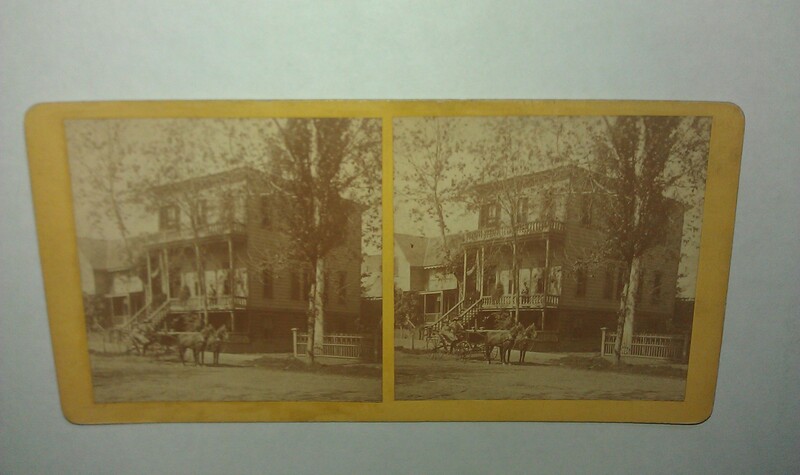 1870s Photographer Johnson Brothers Photo Mark Hopkins Home M Between 5&6th Stereoview Mark Hopkins Residence Horse and Buggy,Sacramento California. Hopkins one of the Big four to Start the Central Pacific Rail Road with partners Stanford, Crocker and Hutington.... Imprint at back - Johnson Brothers Photographers Sacramento Cal. 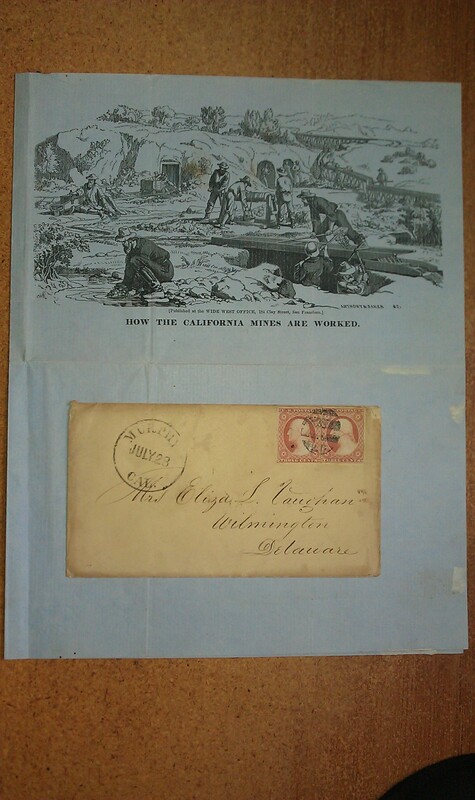 1854 Murphys Calaveras CA Mines Lettersheet San Francisco Sacramento Fires Soda Maker Letter California Gold Rush July 23 1854 two page letter date line Murphys Camp (Calaveras County) letter addressed to Grandma Mrs. Eliza Vaughan Wilmington Delaware. Letter signed by A.F. Vaughan. With mention of getting over being sick a month ago, mention of fires in San Francisco and Sacramento,He says a fire here right now would be devastating. Our Business is Confined to the Soda Manufacturing entirely this season and it will not equal one of last years trade. Letter sheet with original cover, Letter inside the sheet with crease folds. Published at the Wid West Office,184 Clay Street,San Francisco. Art By Anthony & Baker. 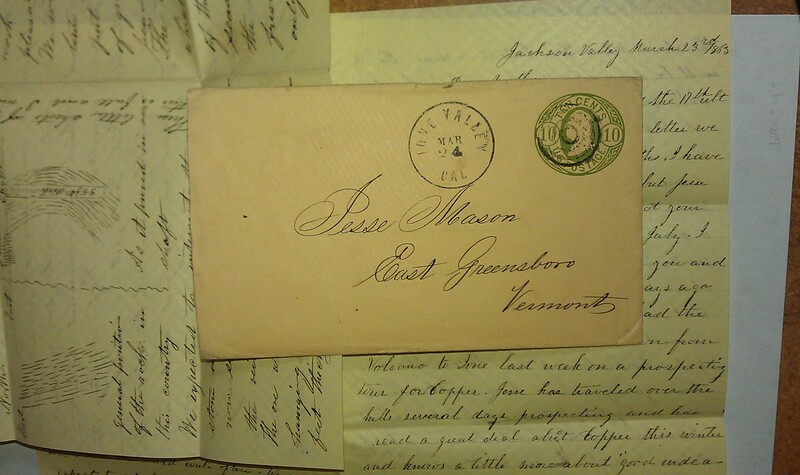 1863 Jackson Valley Ione Amador 10c PSE to Vermont 8 Page Letter Copper Mine Quartz Vein Two letters from brother and sister to mother and parents both dated march 23 1863 ,4 page letter signed by Elizabeth talks about brother and Uncle from Volcano who is a prospector. In the Town of Ione and vicinity,there have been a great many deaths, among old and Young. Chills and Fever,Scarlet fever,Measles,Hooping cough and small pox have been prevailing diseases. Scotty is a great stout boy running out all the time and tanned as bad as an Indian. 4 page Letter signed by Jesse mentions 2 1/2 acres of grapes,Besides Fig trees,pear and apple tree raised from seeds you sent,will bear fruit this season. If silver,gold and copper can make a country rich. California will be rich. Prof. Whitney the state mineralogist state 10,000 men are engaged in mining for copper, and 9/10 of labor is thrown away. Last page with description of his mine with vein from 1 inch to 4 ft thick. Hand drawn vein with general position and depth. 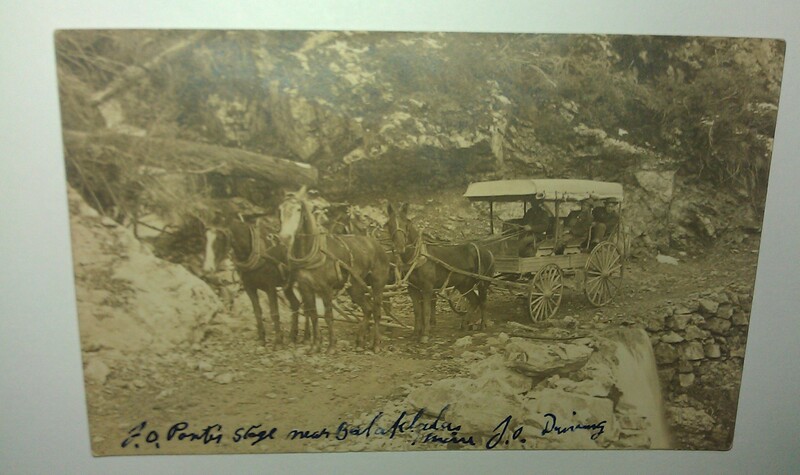 1909 Coram J O Porter Stage Near Balaklala Mine To Boyer Oak Shasta California Photo Postaly used April 10 1909 Shasta County California photo post card with some wear at corners. Manuscript title at lower of image J.O Porter Stage Near Balaklala Mine,J.O. Driving. Addressed to Miss Laura Boyer Oak Shasta Co.Ca. 1920 Santa Rosa CA Rural Cemetery Vigilante Hanging 3 San Francisco CA Men Photo Post Card Postaly unused Santa Rosa Sonoma County California photo post card with some wear at corners,stains,upper right corner bend. Dirty at back. (AZO BACK)... SOME History... December 10, 1920, Three men, Terrance Fitts, Charles Valento and George Boyd, were members of the notorious Howard Street Gang of San Francisco. They had assaulted two women in San Francisco and had fled to Santa Rosa to hide out from the law. But on December 5, 1920, Sonoma County Sheriff, James Petray, and two San Francisco detectives were shot dead while attempting to capture the three fugitives who were holed up in a home on 7th Street in Santa Rosa. The three fugitives were arrested for the murders of the Sheriff and the two San Francisco detectives and were taken to jail. But before a trial could be held, on December 10th, a mob of masked vigilantes broke the three men out of jail, drove them to Santa Rosa Rural Cemetery and hanged them from a tree branch. 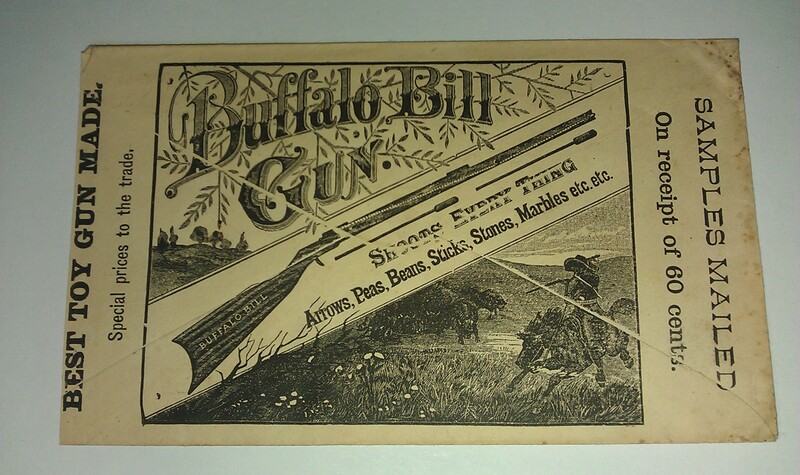 1887 Wilson Bros Co Buffalo Bill Gun Best Toy Gun Made Illustrated Buffalo Hunt Ad Cover March 11 1887 New York canceled overall Illustrated advertising at Back of cover . Toy gun shoots every thing arrows,peas,beans,sticks,marbles etc..
1878 San Franisco CA Dry Dock Co $1000 Bond 1 Printer Bosqui Comstock J. 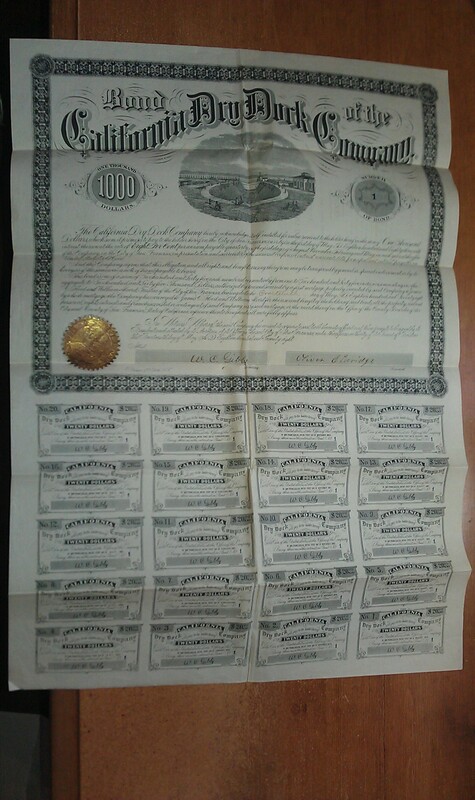 Flood One Thousand dollar Gold Bond number 1 Issued to bearer May 14th 1878. Signed by Oliver Eldridge, President, and W. C. Gibbs, Secretary. Vignette of a dry dock located along the shore of San Francisco Bay, top center under company name. Black border and print. Gilt seal. Uncancelled. 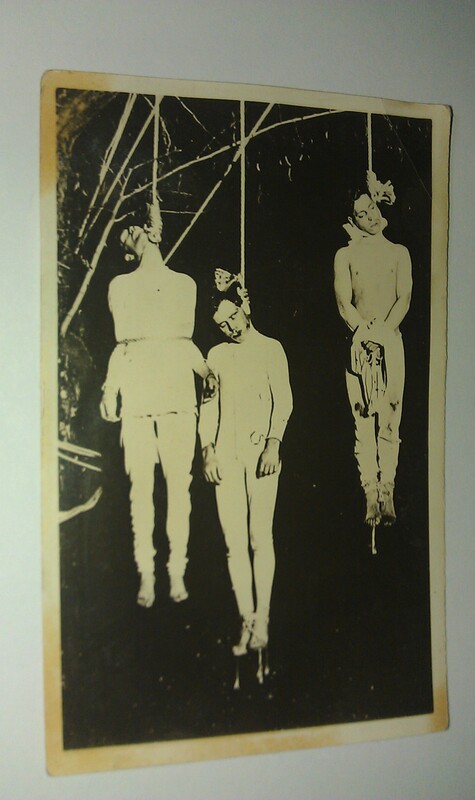 Printed by E. Basqui, San Francisco, 15 3/4 X22 1/2 inches, 20 coupons attached. Endorsed on reverse by J. C. Flood and William Alvord. James C. Flood was one of the great San Francisco entrepreneurs that successfully rolled into fortune. The owner of a saloon located right next to the San Francisco Stock Exchange, Flood along with his partner William O Brien soon became fast friends with John Mackay and James G. Fair, great speculators on the Comstock Lode. In 1868 Flood and O Brien opened a stock brokerage firm and, Flood took over the Nevada Bank of San Francisco, at one time the largest bank on the West Coast. Alvord was a key partner to Huntington, Hopkins, and Stanford as part of the Big Four. He was involved with most of the successful early railroads of California including the Placerville Railroad. He was at one time the president of the Bank of California. signature of one the famous Bonanza Kings, James C. Flood.